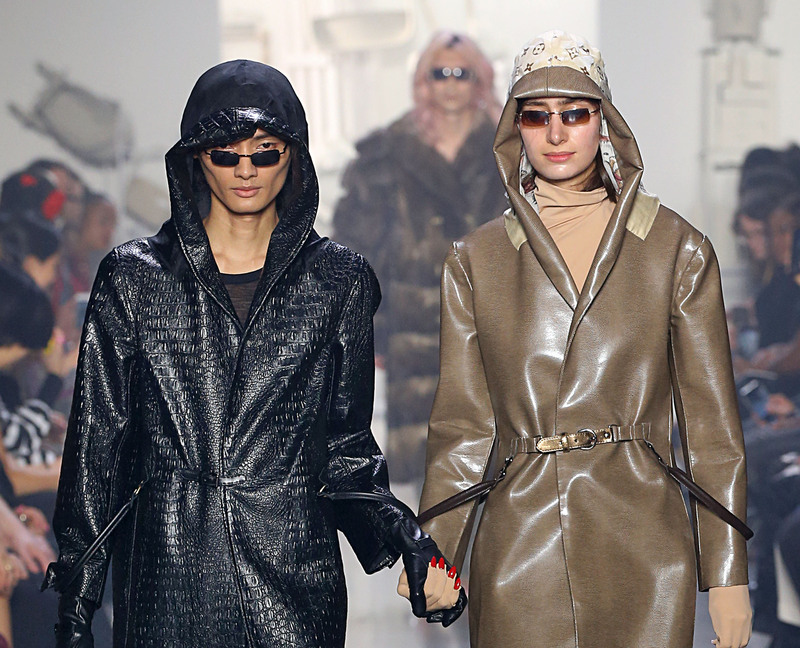 The first models hit the runway wearing massive, boxy “sofa jackets” by Erica Kim 18 AP. 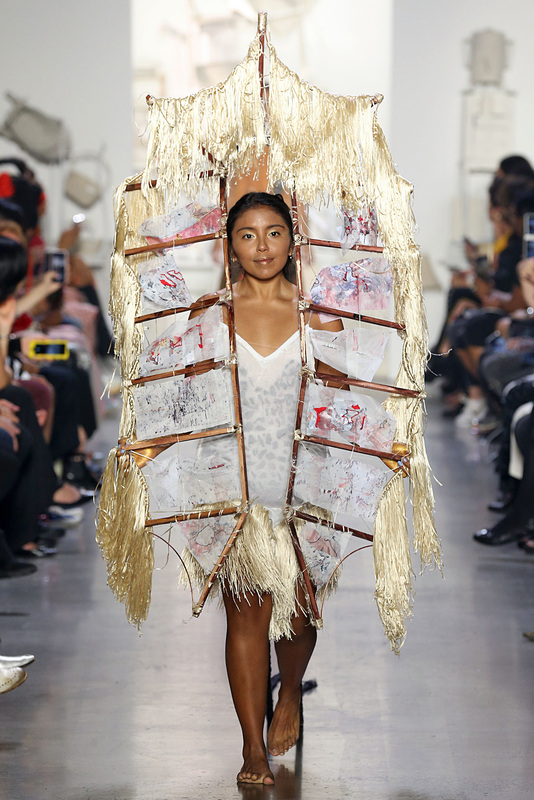 The New York fashion world got its first tantalizing look at the creative vision of RISD’s latest Apparel Design graduates at NYFW (New York Fashion Week). Sponsored by Tommy Hilfiger and held at Spring Studios Gallery I, the Collection 18 runway show on September 12 featured stunning and transformative collections by 14 members of the Class of 2018. Backstage before the show, designers were calm and focused as they put the finishing touches on their models. Hoods and space-age makeup ruled the day, and designers were careful to choose accessories that accentuate and further unify their unique bodies of work. Work by Yufei Liu 18 AP reflects on China’s relentless urbanization. A hush fell over the crowd as the show began with massive, boxy “sofa jackets” by Erica Kim 18 AP, whose subversive collection examines the intersections between upholstery techniques and garment construction. Her looks were followed by contemporary designs from Lou Rodgers 18 AP, who utilizes home textiles in surprising ways. Models wearing Fernando Flaquer 18 AP designs took the runway next dressed in neutral palettes and loose, comfortable forms inspired by music and fashion of the 1980s and ’90s. 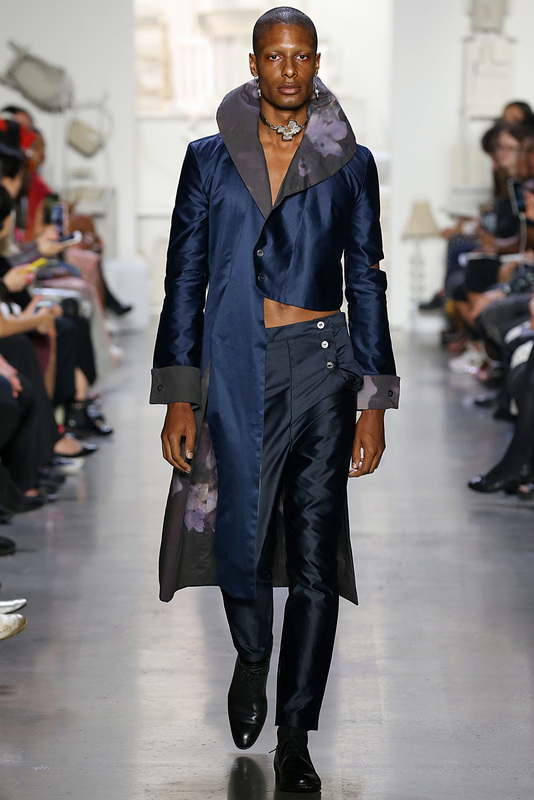 “The tailored and tight contemporary style of the 21st century has been traded here for a comfortable, nonconforming style that obscures the silhouette and protects the body from bias and prejudice,” the designer notes. Comfort was the last thing on the mind of Matthew Streepy 18 AP, whose multi-pocketed menswear pieces are inspired by camping gear and workwear and meant to illustrate “absurd or frivolous functionality.” And even more challenging to wear are the ferocious looks created by Maya Ortiz 18 AP, whose models stepped out in complicated wooden headpieces inspired by brujeria, or Mexican witchcraft. A cohesive collection by Persephone Bennett 18 AP presented models in startling smeared black lipstick and eye makeup meant to represent the designer’s personal past traumas. The ugly visages contrasted with chunky pink and lavender knits; frothy, feminine dresses; and a stunning ode to the Jazz Age constructed of beads and feathers. Fanciful and well-crafted looks by Apparel Design seniors wowed the crowd at the runway show known as Collection 18. 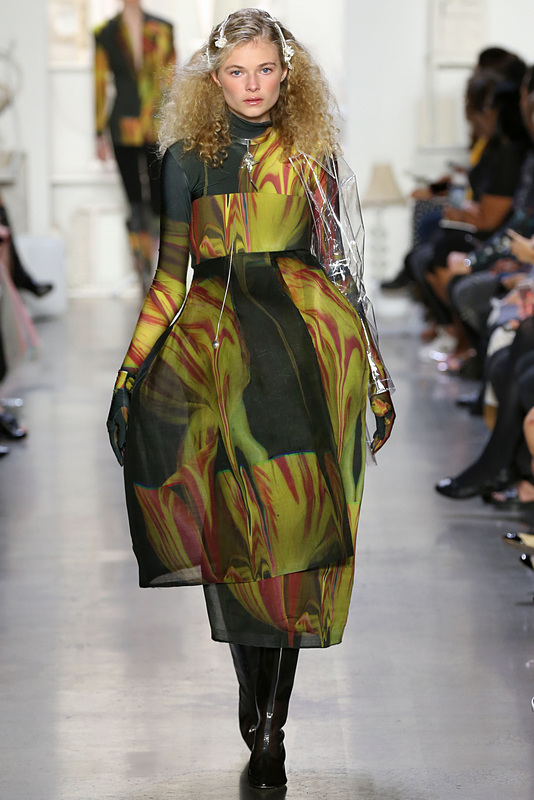 New Apparel Design graduates blew the crowd away at a standing-room-only show in NYC. Recent Apparel Design graduate William Lathrop 18 AP creates high-end couture for men.